While chatting with a friend lately,I was asked how I got transformed into a "cook" from a bubbly teenager.I haven't,[age,yes but not the cooking part:)].There are days when I literally drag myself into the kitchen to cook something.Cooking is not "all" I do,but no,if I say I have a food blog,some people think all I do is cooking,far from that actually:). Sugar diamonds are very popular as a sweet and crunchy snack.Usually,a recipe search for the same would give you recipes which uses eggs as a binding agent for the dough.Here is a simple eggless recipe which you can whip up in less than 30 minutes:). Mix together maida and salt. Add water little by little and knead into a stiff dough. Make 7-8 balls of the same size and keep aside. Roll each ball into a thin chapathi. Using a cutter[or a knife]cut diamond shapes. Deep fry in hot oil till crisp[not brown]. Powder the sugar with the cardamom. Mix the powdered sugar into the hot diamonds swiftly,but take care not to break it. Shake it a little so that the sugar is coated all around. the savoury is more my favourite..but are right about not being able to stop with just one. We call them "diamond cuts". i love this..i agree with you..my grandmom has much more energy than me even at this age..
Wow looks so good and loved the step by step instruction photos..
Why you make me drool early in the morning Divs ? lol..thats a great recipe,made me nostalgic again reading your amma and aunty..long live them...World is a better place only coz of inspiring people like them..
U r 100% rite divya, No one can eat just one !!! Dhivya...you asked me for a recipe in the blog, right? ;)///soon (hopefully).. It's so true that no one can eat just one! As Rachel said, we call them diamond cuts. Ya, i love this too.. yummmy! Yummy Sweet Thukdi! 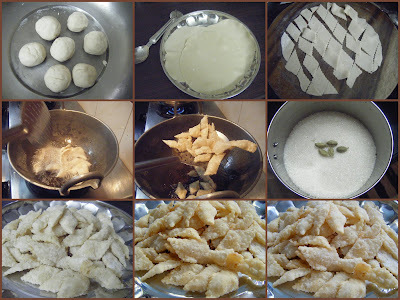 !Thikdi - Thats what we call it.. very tasty & surely i cant stop with just 1 !!! Yes, I want them too. I guess all moms are angels, you wish and they grant. 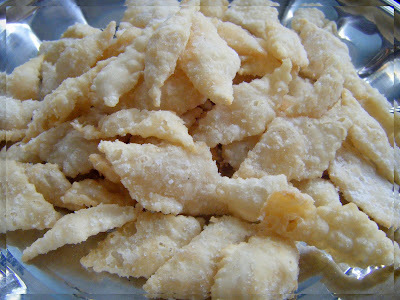 Its so tempting.. my mil makes them too.. but for Diwali! This is one of my favorites too - I make this quite often at home. The easiest way is to buy the ready made tortillas available in the US and just cut them up, fry them and sprinkle powdered sugar on it while still hot. Great Snack. Good post ..but it leaves me confused.. so u r not a natural cook? or do u find it un-cool to be perceived as a cook? I know some people say they don't cook because they think that's cool. Well, isn't it natural to be perceived as a cook when u have a food blog? Whatever be the case, ur blog is very interesting..keep posting..
How nice DK...love the fact that these are eggless! Pav Bhaji ~ Street food at its best!! Few awards,a Tag,some info and just bla BLA bla! !